This seminal book, based on 30 years of research, provides a radical insight into the reality of the business landscape and the operations and management of companies within it. The book challenges orthodox ideas of the business market and business management and presents a comprehensive analysis of the structure and process of business and the tasks that managers and policy-makers face. All are world class academics in the area of business to business marketing and networks as well as key members of the IMP Group. (Industrial Marketing and Purchasing Group). Håkan Håkansson is Professor of Industrial Marketing at the Department of Innovation and Economic Organization at BI Norwegian School of Management in Oslo., Norway. Lars-Erik Gadde is Professor of Industrial Marketing at Chalmers University of Technology, Sweden..
Ivan Snehota is Professor of Marketing at the USI, University of Lugano, Switzerland. Alexandra Waluszewski is Professor of Business studies and Director of the Science & Technology Studies Center (STS) at Uppsala University, as well as a senior lecturer in the Department of Business Studies, Sweden. Chapter 1 A Jungle or a Rainforest? 1.1 A changing business landscape. 1.2 The necessity and danger with metaphors related to the business world. The business world as a jungle populated by competing rivals. The business world as a co-evolving rainforest. 1.3 The content and disposition of the book. Part 1 Business Networks in Action. Chapter 2 Interaction as a way to deal with Relatedness, Variety, and Motion. 2.1 A Need for a Different Theoretical Approach. 2.2 A Business Landscape Populated by Interacting Companies. 2.3 Interaction and the Larger Business Landscape. Chapter 3 Analyzing Business Interation. 3.1 The Idea of Business Interaction. 3.2 Interaction Processes Between Companies. 3.3. An Initial Conceptualization of Interaction. 3.7 A Model of the Interaction Process. Chapter 4 Doing Business: Exploiting Time and Space. 4.1 Using Time and Space. 4.2 Interaction as a Way to Take Advantage of Development Over Time. 4.3 Interaction as a Way to Take Advantage of Development Over Space. 4.4 The Company in the Interactive Business Landscape. Part 2 The Elements of Business Networks. Chapter 5 Interaction and Resources. 5.1. Economic Resources in the IMP Framework. 5.2. An Initial View of Resources in an Interactive Business Landscape. 5.3 Resources and Business: Basic Propositions. 5.4 An Interactive World Full of Resources. 5.5 Combining new and existing resources. 5.6 Resources and their multiple contexts. 5.8 Business relationships and resource development and use. 5.9 Resources in Time and Space. Chapter 6 Interaction and Activities. 6.1 An Interactive Business Landscape Full of Activities. 6.2 Basic Propositions About the Nature of Activities. 6.3 Key Issues in Activity Configuration. 6.4 Central Features of Activities. 6.5 A Framework for Analysis of Activity Patterns. 6.6 Balancing in Activity Patterns – Three Empirical Illustrations. Chapter 7 Interaction and Actors. 7.1 Actors in an Interactive Landscape. 7.2 Actors in the IMP Research. 7.3 The Idea of Actors. 7.6 Challenges in Conceptualizing Actors. Part 3 The Business Network as an Analytical Tool. Chapter 8 Management and Business Relationships. 8.2 When Management Theory is Coloured by the Idea of a Market. 8.3 When Relationships are Observed From a Market Based Management Perspective. 8.4. Conclusions – Relationships and Still a Market? Chapter 9 Managing in the Business Network. 9.2 The Start - The Relationship as a Unit of Analysis. 9.3 How Do Companies Interact? 9.4 How Should Companies Interact? 9.5 Managing and the Interacting Company. 9.6 Managerial Patterns in Business Networks. Chapter 10 Evolution of the Business Landscape. 10.2 Time and the Business Landscape. 10.3 The Narrative of the Evolution of Economic organizing. 10.5 A Network View of Business Evolution. Chapter 11 Networks and Industrial Policy. 11.1 Networks – One Word But Many Meanings. 11.2 What Principles are Network Policies Resting on? 11.3 The Taiwanese Semiconductor Development – From Virgin Land to a Successful Business Network? 11.4 The Heaviness of Business Networks. 11.5 What's in the Shadow of a Successful Network? 11.6 The Dark Sides of Networks. 11.7 The Different Logics of Development, Production and Use. Chapter 12 Living in the Business Rainforest. 12.2 Living in the Rainforest. 12.3 The Entrepreneur and the Business Rainforest. 12.4 The CEO and the Business Rainforest. 12.5 The Financial Accountant and the Business Rainforest. 12.6 The Consumer and the Business Rainforest. 12.7 The Politician and the Business Rainforest. Authors are world leading authorities on this topic. 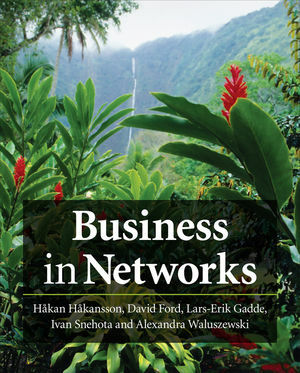 This book is the result of an evolution of thought that redefines the area of business networks. The IMP Group provides an alternative to the traditional view of business to business interaction, this alternative view is widely used throughout Europe as well as Australia and the US. This book is the culmination of empirical work by the thought leaders in this area. More emphasis is being placed on the idea of business networks within the business to business area and more courses are therefore being developed to meet this demand.